The OS will actually use the same OS as the iPhone. I mean why else would they invest so much in a paired down OS if they’re only going to use it on one platform? Ludicrous! 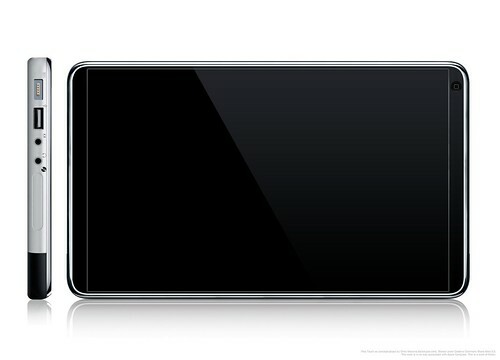 Instead, this device will basically be a glorified iPhone, just 2.5x the size. Here’s the kicker <wild conjecture>: the iPhone SDK was delayed in order for 1) Leopard to come out (so you wouldn’t write Tiger-apps for the iPhone) and 2) because this device will launch at MacWorld, and the iPhone SDK will work for the Apple iPad Touch as well.</wild conjecture> Pretty clever eh? 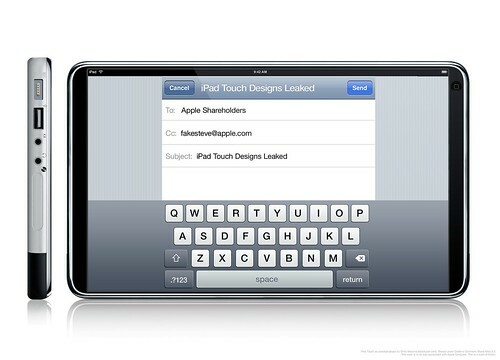 Just like the name implies, and just like its cousin the iPod Touch, this device is all about tactile user interface. There’s no solid state keyboard on this bad boy. Instead, it’s a pure software keyboard, able to be gloriously adapted and regiggered to fit the task at hand, or able to have key identifiers in any language imaginable. Heck, you could even have a Halo-specific keyboard with specific buttons for each type of grenade. To add an additional Minority Report-quality to this device, Apple will probably introduce their own software-driven version of the clickwheel, and it’ll probably look something like the QuickSilver constellation menus or the new Sapiens app. This interface will be necessarily for navigating around without a Dock and without having to return to the home screen. And, don’t forget how good CoverFlow looks at larger sizes. Although this device wouldn’t have a CD or DVD slot, it would still be an excellent device for movie playback (for all the movies you buy from the iTunes store, of course!). Imagine being cramped in an airplane seat — no more dinky iPod Video… and no more awkward 15″ laptop. You get a perfectly mobile, conveniently flat device for even the seats with the least legroom. Speaking of the lack of optical drive (well, the bottom-loader theory is interesting)… this device is all about wireless, just like the iPod Touch. Fortunately it has all the same ports as the MacBook Pro, but is only as thick as the lower part of that system, given that the screen is just a thin layer above the inner workings. There’s no mouse or touch pad on this device (though you can add a mouse via Bluetooth or USB). As with the Touch series, you interact with everything directly, rather than having the traditional out-of-body pointer experience. Dashboard Widgets really get their due here with a souped up WebKit rendering engine — supporting CSS animation and transforms, downloadable fonts, offline storage (for those airplane rides, again) and SVG, not to mention a lot of Core Animation goodness. And yes, with the SDK, native apps will of course be possible. Losing the optical drive helped another area that rocks with this device: battery life. It’d say 12 hours without too much trouble, thanks too to converting to flash drives. So that’s about it. Part of this exercise was just to come up with a bunch of random ideas and see what other people think or what they want from an Apple tablet. 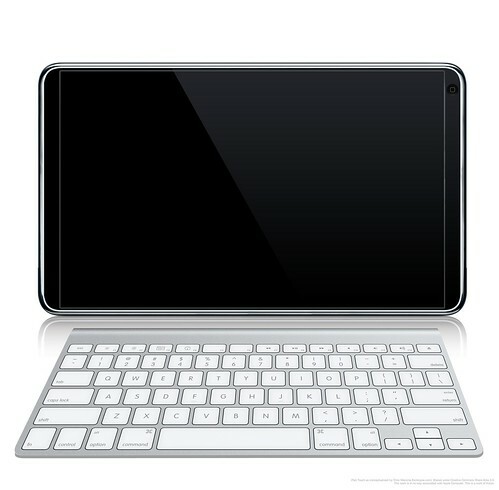 If you ask me, less is more here; I don’t want just another Windows-style tablet with all the bells and whistles. I actually like my iPhone better without third-party apps. 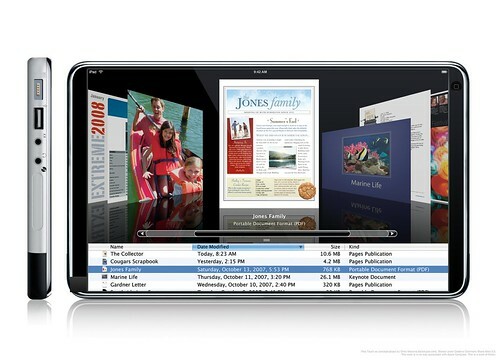 If Apple’s going to build the Apple iPad Touch (or whatever better name they come up with), I expect nothing less than a slick, streamlined experience that feels less like a computer and more like a lifestyle object. This baby will retail at $699 for 32GB and $899 for 64GB (remember, flash drives are still pricey) available immediately (well, if I were speaking at MacWorld 2008 it would be…). So I’ve decided to take a more aggressive approach to the interface and interaction design of Flock. It’s risky, a bit unorthodox and is something that will take some practice, but since it worked fairly well while I was working on Spread Firefox, it seems only logical that I pursue a more transparent, collaborative and inclusive design process. So what does this means? Well, basically a whole lotta Flickr! I’ve already posted a couple screenshots of what the Flock Photo Uploader should look like (compared with how it’s been looking in recent builds). This accomplishes a bunch of things, beyond getting the design process out in the open. For one thing, it allows me to communicate the intended appearance of features to many developers at once (instead of having my designs vanish on one of the nine levels of Bugzilla hell). I can add notes, a description and all that other good stuff that your typical Flickr photos have, but I can also link them to actual bugs in our system with tagging. For example, flockbug1655. This means that if other people have uploaded mockups to Flickr as well about the same bug, we can all see and compare each other’s work and, going one step further, if anyone has blogged about that bug, we’ll be able to discover that content with Technorati. Truly distributed bug squashing! 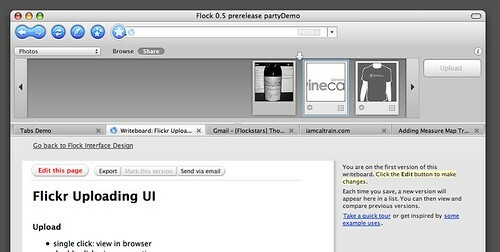 Now, obviously we’ve already got groups on Flickr for Flockbugs and Flock Experience Design. Those are the two obvious places to go to see discussions on these topics. The problem becomes very quickly, however, that all this information is in Flickr and not shared in our developers’ native environs. So I’ll be working with Daryl to add a feature in Drupal that will aggregate this information (primarily based on tags). We’ll obviously be able to show full mockups as well using the Flickr API and then hook in data directly from the bugzilla bug (that’s the hope anyway). Finally, I’ll be working with Gandalf on a Flockzilla Contributor Dashboard — designed from the ground up to make it easy to keep tabs not only on what’s going on in Flock development, but also on your own task list. This will again aggregate information from all kinds of disparate sources and will support your involvement based on custom community roles (designer, bug killer, developer, interested blogger and so on). This tool will of course feature into the planning for CivicForge but for now it makes sense to address our internal use cases. But at least we’re starting somewhere and trying to find new ways of opening up open source design to a wider pool of eyes!